Jachnun is one of those dishes that everyone in Israel loves but few actually make themselves. 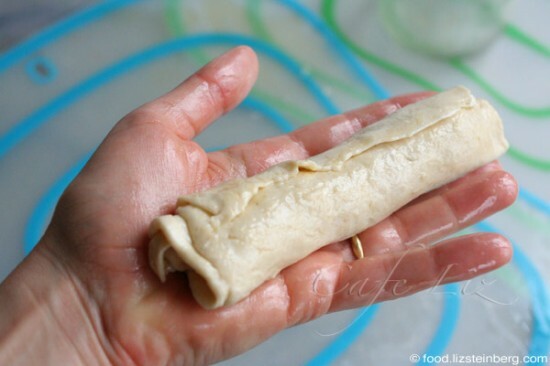 These rolled sticks of dough are a Yemenite Jewish food. The dish is one of many slow-cooked Jewish foods invented to be prepared a day in advance and baked all night long, so that there would be hot food on the sabbath, when lighting fires is prohibited. Brought over by Yemenite immigrants from Aden, jachnun was warmly embraced by Israeli society as a whole. Originally, it was baked under the coals in families’ outdoor tabouns, recall immigrants’ children. 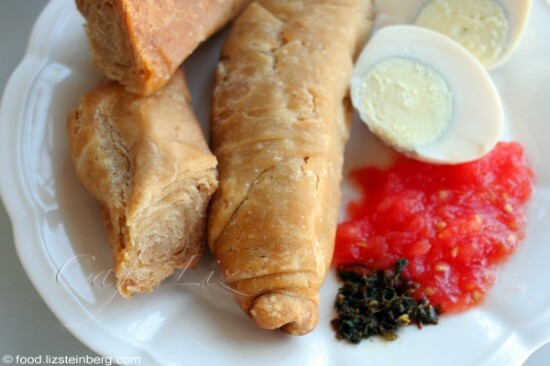 It’s traditionally served here with grated fresh tomato, skhug (Yemenite hot sauce), and a hard-boiled egg, cooked in the pot along with the dough. You can find it sold at roadside stands, restaurants and rest stops; for those who want to feel like they’re making it themselves, you even can buy it frozen at the supermarket. All you have to do is fit the frozen logs into a jachnun pot and bake overnight. Mind you, there are people still making jachnun from scratch. (There are supposedly even people still baking it under coals — though not many.) It’s not too difficult — you make a dough of flour, white sugar and water, roll it out thinly, coat liberally with margarine and roll it up. 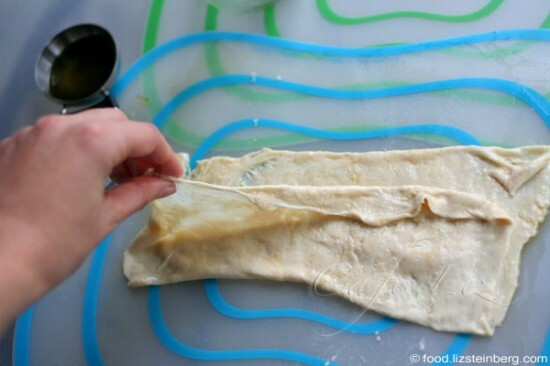 Yemenite filo dough. Yes, this is one unhealthful food. But fortunately, if you’re making it yourself, you have some control over that. Most modern-day jachnun recipes include white flour, white sugar and margarine. This is a modern development — the white flour was once whole wheat and the margarine was clarified butter, say Yemenite quarter residents. The sugar was probably date syrup, if it was used at all. Few people prepare it that way today — the perception is that there’s no demand — but there’s no reason not to. Dough made with white flour is more elastic and can be stretched thinner, but I found the whole-wheat jachnun to be more satisfying — you’re not eating empty calories for breakfast. Either way, you’ll be full for hours afterward. I also used olive oil in place of the margarine, which made my jachnun drier and distinctly not greasy. Using clarified butter, known as samneh, is also a viable (non-parve) option, and this gives the jachnun a lovely flavor you won’t find in the commercial variety. I sometimes bake my jachnun in a slow-cooker instead of in a metal pot in the oven. It works. Jachnun gets its flaky texture from layers upon layers of rolled dough. As I was examining jachnun pots at the market, a nearby jachnun/falafel vendor started asking me if I make it myself — rolling out the dough and all. I told him I did. Don’t use a rolling pin, he told me. He doesn’t use whole wheat flour, by the way, because it’s not stretchy enough. So that’s the proper way to do it — one of them, at least. I’m not quite there yet, and my layers are probably a little thicker than his. Plus, the dough isn’t as elastic if you use whole wheat flour and not white flour. But the final product still tastes good to me. A few other things before I start the recipe: I sprinkled dried powdered yeast on the rolled-out dough, along with the oil. I only found one reference of someone else who did this, but I liked the light flavor and slight airiness it added. Also, this recipe will make six jachnuns. You might want to make twice this amount. Or make six whole-wheat jachnuns and six white flour ones, which is what I did. Note: I’ve tagged this recipe as parve and vegan because the jachnun itself is parve and vegan. Serving it with eggs will make it not vegan, and using butter instead of oil will make it dairy, and not parve or vegan. 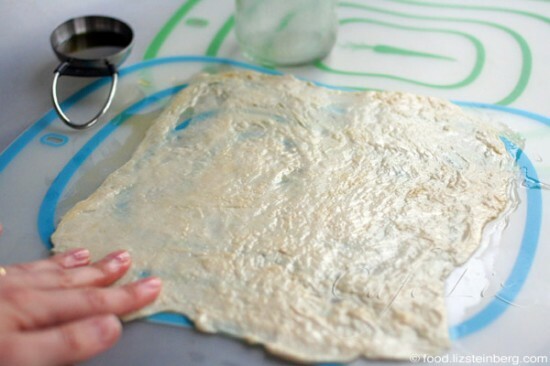 Mix the flour, date honey, baking powder, salt and water to form a dough. It will be sticky, and that’s OK. Knead and let sit for at least 10 minutes. Some people say it needs to sit overnight, but that’s not a consensus; I strive for an hour. Knead again and let sit again. The waiting makes the dough easier to work with and lets the gluten develop. Divide into six balls. They’ll be about the size of tennis balls. Oil your work surface. 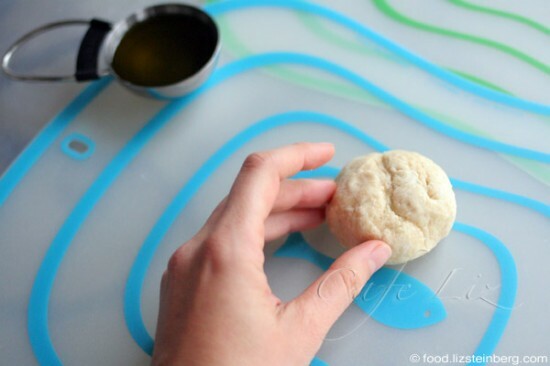 Using your hands and/or a rolling pin, roll out the dough into a 40-by-40 centimeter (16 inch) square. Oil it as needed. The dough should be very thin. If it tears, try to push it back together, but it doesn’t really matter — once it’s folded, the imperfections won’t be noticeable. Rub liberally with olive oil (or softened margarine or butter — about 1-2 teaspoons oil, 2 teaspoons butter or 1 tablespoon margarine); sprinkle lightly with yeast (if using). Fold over into thirds. You now should have a long, narrow strip. Brush oil on the top layer. Roll out again in both directions. Your strip should now be wider and longer. The width of the strip will be the length of your finished jachnun. Start rolling up the strip. 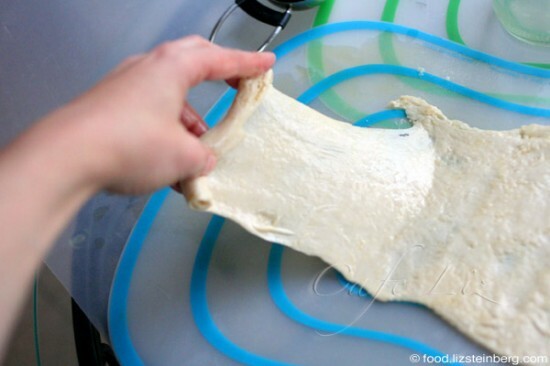 Pull the dough as you go, to stretch it out even more. Here’s the finished roll. (See? None of those tears are visible anymore). Arrange a thin layer of stale bread on the bottom of your baking dish or slow cooker. The bread pads the jachnun and absorbs excess oil. The traditional jachnun pan is a cylindrical metal tub with a tight-sealing top, but you can use any oven-safe dish with a tight lid. Cut strips of baking paper slightly larger than each jachnun. Rest each roll on its strip of paper — this isn’t necessary, but it will keep them from sticking to each other and falling apart when you remove them from the pan. Arrange the paper-coated jachnuns in the dish. They should be packed relatively tightly. If you want, arrange a few clean eggs in with the jachnun. They’ll come out hard-boiled. Cover with tinfoil to help preserve moisture, seal the pot and bake overnight, for 10-12 hours — on the low setting of your slow cooker, or at 100 to 110 degrees Celsius (210 to 230 Fahrenheit) in your oven. 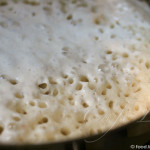 Once baked, whole wheat jachnun will come out nearly chocolate colored; white flour jachnun will be light golden. Serve with grated tomato, skhug or hot pepper sauce, and hard-boiled eggs. 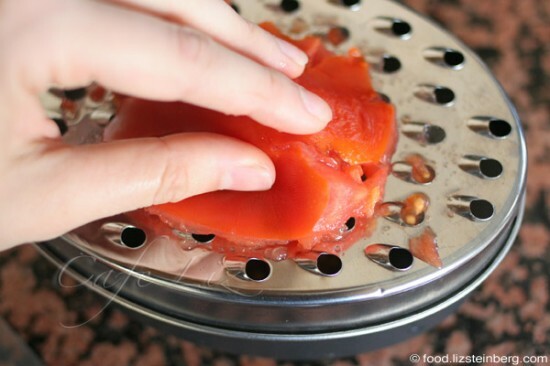 To grate the tomatoes, simply slice them in half and grate the cut side. You’ll get tomato pulp, and the peel will be left in your hand. For me, one serving is one jachnun, one grated tomato and one egg, but these ratios vary by taste. 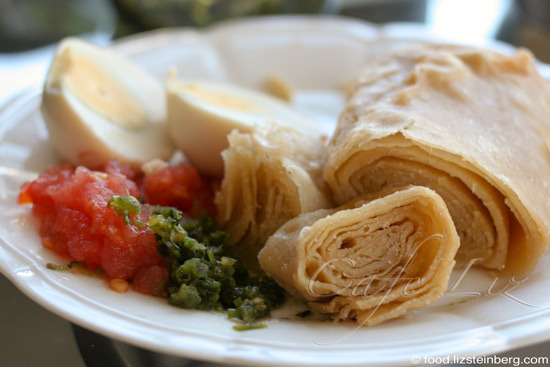 Malawach is another Yemenite bread. 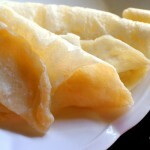 It’s made from the same dough as jachnun, but instead of being rolled up, it’s folded into sheets and fried in a pan. One of the balls in the above recipe would make about a 20-by-20 centimeter (8 inch) malawach. Fry the dough on both sides, and serve with the same condiments — tomato and egg. Or use other condiments of your choice. 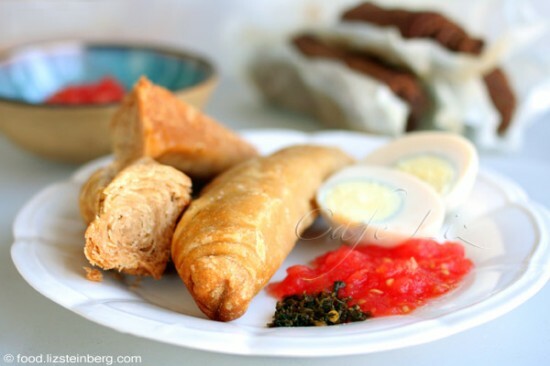 21 Responses to "Jachnun — Yemenite breakfast"
awesome! I am so excited to follow this healthier version once as soon as I have an oven. Nice job. Wow what a stunning blog ! So glad I stumbled upon it! I am always looking for good healthy vegetarian recipes. I’m excited to try a few I’ve seen here! I remember the first time I tasted Jacnun I think I liked the grated tomato “salsa” more than the jacnun itself that was until I got to taste a homemade vertion of the Jacnun WOW what a treat..thanks for the recipe great photos. I’m a “new kid on the block” wanted to introduce myself and my blog. I love trying new things and giving my “2 shekels” worth on them. You and your readers might enjoy reading my reviews. Wow – I can’t wait to try this healthier version. I’ve never made them myself (all that margarine sort of put me off) but since I’m game for anything baked with olive oil, this sounds great. Thank you! Delicious and exotic breakfast recipe. Thank you all, and welcome! clarified butter (samneh) is a traditional yemenite food but when they came to Israel butter was scarce or much more expensive, hence the switch. Lovely looking breakfast, I am sure you didn’t have to eat until evening. I am SO pleased to have found this recipe. I made jachnun for Shabbat lunch a few months ago and although it was really good, I had the feeling that I hadn’t gotten it quite right. In fact, I had shaped them wrong! Thanks for the wonderful photos. I will have to attempt this dish again (and I’ll be sure to report back once I do). Thanks for the insight, Sarah! Rivki, your jachnun looks like it tasted great, even if it’s not the traditional shape! The nice thing about food is that appearances aren’t everything 🙂 Thanks for stopping by. I’ve been putting the frozen Sabra jachnun in my cholent, and now I can make it myself from scratch. Thanks! Very inspired to make the jahnun with whole wheat flour and date honey. Your step by step photos are wonderful. I’m curious about the powdered yeast. Why do you sprinkle it instead of adding it to some of the water? Do you think that if you added the yeast to the dough itself, it might be more difficult to work with? Thanks, Faye. Regarding the yeast, if it were added to the dough itself, there would probably be little air bubbles in it because it would rise. By sprinkling it between the layers, you get a light yeasty flavor but it doesn’t really alter the texture. 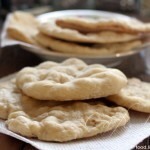 By the way, if you were to add the yeast straight to the dough, I think you’d get something more like kubaneh. Which would still be good, it would just be different. Definitely something worth trying. Thanks for getting back to me, Liz. Very interesting idea to use yeast as a flavoring. Good point about the kubaneh! My Yemenite mother in law taught me how to make it, and it’s delicious, especially when made with butter! But I’m interested in making a healthy version like your jahnun, maybe with olive oil and just a touch of butter. What kind of olive oil did you use? My pleasure. What a great family culinary tradition to have! I just used the cheapest olive oil, the kind you get in plastic soda bottles at the shook, since I figured that a better oil wouldn’t have any flavor left anyway after all those hours of baking. Hello Liz, I really enjoy your blog. I am Pescatarian and I am always looking for practical and sensible inspiration for vegan and vegetarian recipes and I have followed Israeli food trends for 30 years. You have great recipes and stories, thank you. I wanted to tell you that to get more stretch from your whole wheat Jachnun or other whole wheat products use a little vital wheat gluten in with your flour. You will get as much stretch and spring as with white flour. 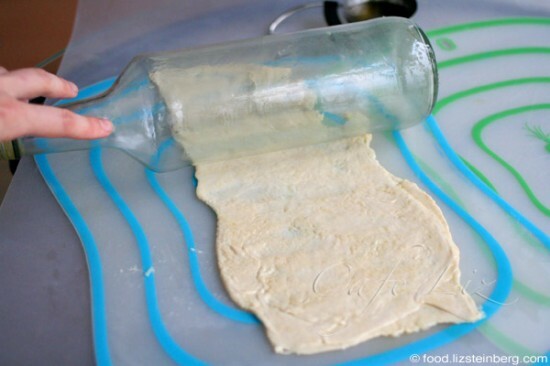 Great idea about sprinkling yeast! Thanks, Adara! I actually don’t know if you can find vital wheat gluten in Israel — I’ve heard that you have to ask professional bakers because stores don’t carry it. Never looked, though.